The cinnamon bear (Ursus americanus cinnamomum) is a subspecies of the American black bear. 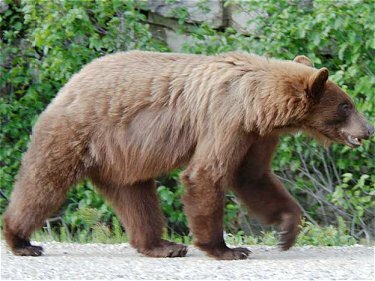 Its only big difference from the common black bear is that the cinnamon bear has a reddish brown coat from which its name is derived. It is believed by many not to be a separate subspecies. 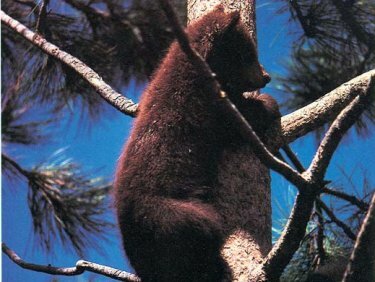 Cinnamon bears can be seen in Southwestern Canada and Northwestern United States, Eastern Washington, Eastern Oregon, Idaho, Western Montana, Western Wyoming, Eastern Colorado, and Northeastern Utah (regions with drier climate). Black bears found in moist climates are much more likely to actually be black. The cinnamon bear is very similar in shape and size to the common American black bear. It stands about 3 feet high when on all 4, and it can weigh anywhere from 200 to 600 pounds, depending on food availability. It has a thicker coat of longer and finer hair than the common black bear. Cinnamon bears are omnivorous creatures, eating mainly vegetation, nuts, fruit, and honey, and occasionally feeding on insects, small rodents, fish, and carrion. Females become sexually mature at 4 or 5 years, males at 5 or 6 years. Mating usually occurs from June to mid July. The gestation period lasts about 7 months. There is a delayed implantation in which the fertilized eggs are not implanted into the mother's womb until the fall in order to give her time to build a reserve of fat for her cubs. The mother gives birth to usually 2 or 3 cubs in January or February during hibernation. They remain with their mother for about 17 months.